Finally we have a solution for getting marks or lines in really narrow places. Countless numbers of times I find that I need to mark layout holes for brackets, but the small holes combined with the thickness of the brackets make it impossible to get the tip of a pen or pencil through. Bleispitz has a new product that is specifically designed to reach into narrow places and make marking a simple task again. What they have is a marker with a tip that is almost a full inch in length (25mm). The tip is made of stainless steel, so we don't have to worry about it being weak, and the marker has been specially designed to not slip into the narrow stainless steel shaft under pressure. Bleispitz is a German company, so if stereotypes are correct, their products should be well engineered. 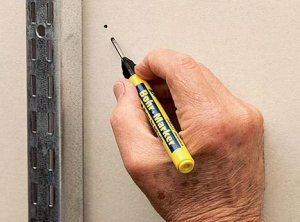 The Bleispitz marker is more expensive than your average marker, but its time saving features might be worth its $8 sticker.